Laugh, Love, and Craft: Free Quart of Glidden Premium Interior Paint While Supplies Last! Free Quart of Glidden Premium Interior Paint While Supplies Last! Right now, sign up for a free quart of Glidden Premium Interior Paint by mail. It started at 11:01 pm CT (12:01 am ET, 10:01 pm MT, 9:01 pm PT) last night, and is for the first 200,000 people to sign-up. I just filled mine out and got the color Tropical Lagoon for a project I've been ready to start for a while. I guess it would have been nice for the bookshelves we made this weekend! 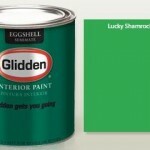 A Tip from Freebies 4 Mom: To choose your color you have to drag that color to the Glidden paint can. After you fill out the form click on “Submit Query” at the bottom (if a button doesn’t appear). Then to confirm your freebie order click on “Place Your Order” on the next page. If you get a page that won’t load anywhere along the way, just hit the back button and try again. When you’re successful you’ll see this message and you’ll receive a confirmation email. Thanks for the share Freebies4Mom! $5 off Bounty Coupon every Friday in June! Sunday Inserts: What Are You Clipping? Lunchables With Fruit Possibly $0.35! High Value B1G1 Free Athenos Yogurt! Get Great Deals, I Just Did! Get A Free Swiffer 360 Duster! 3 Pack of Ivory Soap, FREE! Pampers Gifts To Grow Code Expires Tonight! Free TCBY Yogurt for Mom's! Jergans Natural Glow For Just $0.49 After Coupon!